The lumbar spine can side bend about 20 degrees each way. The spine in your lower back, called the lumbar spine, can bend forward, backward and side to side. It is capable of a small amount of rotation as well. The range of motion, or how far your spine can move, is limited by the disks between the vertebrae, the ligaments that tie the vertebrae together and the orientation of the facet joints on the back part of the vertebrae. Muscle tension can restrict your range of motion as well. Stretching tight muscles may help safely increase your range. Bending forward or rounding your lower back is called flexion. Flexion in the lumbar spine is primarily limited by compression of the intervertebral disks and tension in the ligaments that run along the back of the spine. The normal range of movement of lumbar flexion is 40 to 50 degrees. Excessive flexion in the lumbar spine can result in damage to the intervertebral disks, increasing the risk of a herniated disk. Arching your lumbar spine or bending backward is called extension. It is limited by compression of the facet joints on the back part of the spine and tension in the strong ligament that runs along the front of the spine, as well as by contraction of the abdominal muscles. The normal range of motion for extension in the lumbar spine is 15 to 20 degrees. If tight abdominal muscles limit your range of motion, stretching those muscles with back bending exercises may help increase your range. Individuals with spondylolisthesis -- a fracture of the back part of one of the lumbar vertebrae that can lead to slipping of the vertebrae -- should avoid excessive lumbar extension. The facet joints of the lumbar spine allow for very limited rotation, or twisting. Each vertebra can rotate only one to two degrees before the facet joints compress, preventing further movement. 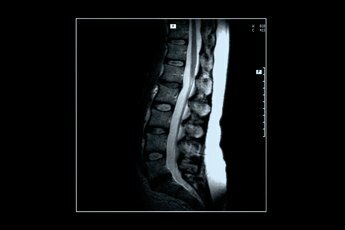 The total amount of rotation In the lumbar spine is only five to seven degrees. This helps to protect the intervertebral disks. If any one segment were to twist more than about three degrees, it could result in the fibers of the disk tearing. Side bending is called lateral flexion. The orientation of the facet joints in the lower back permits fairly free side bending. The normal range of motion in the lumbar spine is about 20 degrees to each side. Lateral flexion is primarily limited by tension in the ligaments and muscles on the opposite side of the spine. If tightness in your oblique or other muscles limits your ability to laterally flex, side bending stretches may help increase your range. What Are the Benefits of Torso Rotation Exercise?